I have problems connecting. Can you help me? Make sure that the app and the Yaesu 817 are using the same serial Baudrate. By default the app works at 9600bps and I suggest you to set the 817 at the same speed (menu 9600). It’s mandatory that the app and the 817 are set to work at the same baudrate. To connect using a USB Serial cable you need an OTG USB cable adapter. Attach the OTG Cable adapter to the USB CAT cable and attach the miniUSB port to the one of your Android device. It is asking which app you want to use for USB connection. Press OK. If more than one app are listed, select “817 Companion” and press “Just Once”. If the popup is not showing it means that there’s some other app that’s been set as default for USB communication. In this case you have to reset default apps. To do that go to your Android settings > Apps and select “Reset app preferences” from the top right menu. Click “RESET APPS”. Now try attaching the OTG+USB cable again to your device and check if the popup shows. If not, try rebooting the Android device. If the popup doesn’t show even after the reboot, then it means that the OTG cable adapter or the USB CAT cable is faulty. To test the OTG USB cable adapter take a USB keyboard or mouse and attach to the OTG cable adapter. Attach it to the Android device and see if it works. If it works then it’s not the OTG cable adapter. If the mouse or keyboard don’t work then it’s the OTG cable. To test the USB CAT cable try using it with a PC/Mac and see if it works properly. If it works then it’s not the USB CAT cable. If it doesn’t work then most likely there is the problem. Once you see the above mentioned popup and clicked “Just once” the 817 Companion app should open. To connect via USB you have to single press the On/off button. If everything is ok you should see the frequency on the app match the one on the 817. Success! At this point the frequency should match the one on the 817. If it doesn’t, test the Bluetooth dongle with a PC/Mac first to understand if there’s any issue in it. can you give me more information about the panadapter kit and how to get it? You can find all the information at the “panadapter” page. IS THERE A VERSION FOR IPHONE/IPAD? IF NOT WHEN WILL IT BE AVAILABLE? The 817 Companion app is only available for Android. Unfortunately Apple doesn’t allow serial communication via Bluetooth or USB. The only solutions actually are to use WiFi or BLE. The only WiFi solution that I know is the Piglet and there’s actually no commercial solution for BLE. I have a working BLE prototype but is not commercially available yet. BLE is also not compatible with all the iOS devices as it needs Bluetooth 4.0 and only the latest devices supports it. So despite of the fact that I’d really like to port the app to iOS, Apple is making things difficult and strictly depending on not so common hardware. DOES THE APP ALSO WORK WITH THE YAESU 857 OR 897? Actually it doesn’t but I’m already working on a 857 Companion app but can’t tell you when it’ll be available. It shouldn’t take too much. I think before the end of September… maybe before. For the 897 things are a little more difficult as I don’t have access to an 897 so can’t test what I develop. So definitely out of the plans for now. YAESU FT-857 AND YAESU FT-897 are basically the same rig just different housing, so whatever works with one will work with other. I’m actually working on the 857 Companion. Will this work on Linux? I run Arch Linux and would be keen to run it on that computer. No it only runs on Android devices. 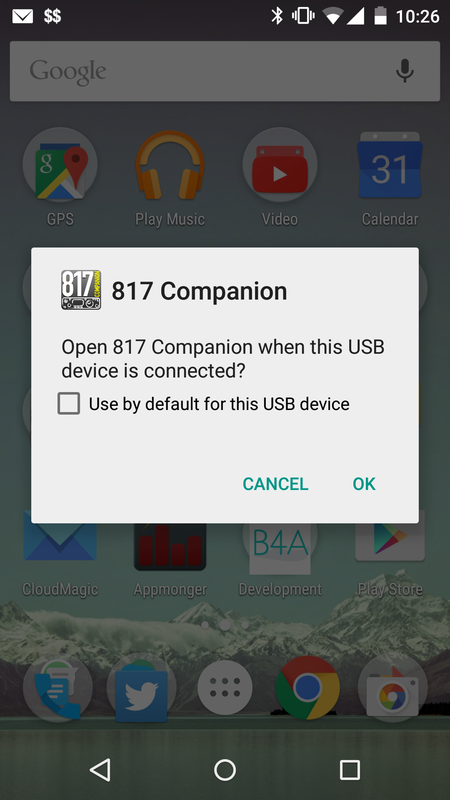 “Allow the app 817 COmpanion to access the USB device? The GTO USB cable works with the tablet and a USB keyboard. The USB/Cat cable from RT Systems works correctly to upload and download frequency and system settings from a Windows 7 laptop to the FT-817ND. When I depress the ON tab I receive a red “Error opening USB port” Once that happens the error continues. The radio’s frequency is not displaying. Is the version I’m running causing difficulty or is there something else you suggest I can try? I can’t wait to get this running — it’s a beautiful program! if this is a java based app for Android, would it be relatively easy to port to Linux, OS X, and Window? I’d love to run it in Ubuntu. Please consider! I need help here. 817 baud rate matches. Android Galaxy Tab A. I see Bluetooth device on Android and it is paired. The device is blinking blue when startup. I press the OFF button long press. App says searching for devices but then says” No device found”. Suggestions?? which android version do you use? 6.0 or higher? I have the same problems here with Android 6.0 and 7.0 on two different devices. I have Computer Lenovo TAB3 Essintial and USB adabter LD-C100 USB to CT-62. Works with PC and Ham radio deluxe. OTG gabel works fine with keyboard and mouse, but not your app, Is there some solutions for that? When I try the export, the frequency is wrong, it is kHz instead of Mhz. Furthermore, the RST fields are always 3digit, even in non-CW modes. This causes some trouble after import into PC software. Is this correct what you have wrote before? To test the OTG USB cable adapter take a USB keyboard or mouse and attach to the OTG cable adapter. Attach it to the Android device and see if it works. If it works then it’s not the OTG cable adapter. If the mouse or keyboard don’t work then it’s the OTG cable. My OTG adabter works with mouse and keyboard with Lenovo TAB3 7 Essential. 817 Companion is not workin in my Lenovo tab with usb/otg connection with LD-100 USB to CT-62 cable. LD-100 works well with my PC and HRD! The CAT cable uses the ACC socket on the 817, but so does my LDG ATU. If I make a splitter can the two devices be connected in parallel? I have a problém with cluster (DX Cluster not reachable…). Internet connection is OK and even more, if I open https://www.dxcluster.co.uk directly it works. Any update on the 857 Companion? Thanks in advance! unfortunately not. I still have to find some time to update the 817 version and fix a couple of issues. Sorry to hear that there are no plans for the FT 857… I have 857 and I’m 100% interested in the software. I guess that a lot of other ham operators will be interested too – because gui of your sotware looks nice and whole software is very useful and 857 radios are still in production and very popular. Do you think that in the future can i buy 857 version? yesterday I spent the whole day to get two different Bluetooth modules working with the 817 compagnion, which I downloaded from the google playstore. I tried it with twoAndroid devices. One is a Smartphone from Sony with Android 6.0.1 and the other is a tablet from Samsung with Android 7.0. After installing Pocket rxtx from Dan I discovered the same Problems. Dan gave me a link for a newer version of his software and now everything works fine. Hi Andrea, did you get in the meantime a Yaesu FT-857D radio for further development? If not, why did you start that project? Just for fun?! I can not get either usb cable or Bluetooth dongel to Work. Both cable and Bluetooth Work on my PC and Mac. I can connect with Bluetooth terminal on Android to the ft817, but not with the companion software. Reinstalled the software but no. I took the app out of the store as it needs to be updated but I don’t have time now.